In response to a $17 million funding shortfall from the state of California this year, City College has cut 67 classes from its Spring 2012 schedule. Half of those classes went in a “first wave” of cuts in December while the others were cut as recently as two weeks ago. As reported in our last issue, many of the classes in the first wave were fully pre-enrolled. Interim Vice Chancellor of Academic Affairs Joanne Low spoke to the College Planning and Budget Committee on Feb. 15. She stated that efforts were made to transfer displaced students into other class sections. The packed room sat in tense silence as Low and Chancellor Don Griffin made their presentation on City College’s dire financial situation to the committee. California “trigger cuts” took $13.5 million from City College in December of 2011, which the college planned for, but in the past month the state has asked for an additional $3.6 million from the school. The chancellor was referring to the upcoming state audit. If they find that the college is financially unstable, a state administrator could be placed in charge of the school, assuming the power of the college’s board and chancellor. The chancellor said they would use every possible contingency to prevent that. Vice Chancellor of Finance and Administration Peter Goldstein said that over $10 million was saved this year with “one-time use” funds. Next year those options won’t exist. Fiscal year 2012-13’s budget looks even worse, said Goldstein. It will see at least the same amount in cuts, $17 million, with a possibility of losing another $25 million total if no tax-raising plan passes in the state-wide election this November. 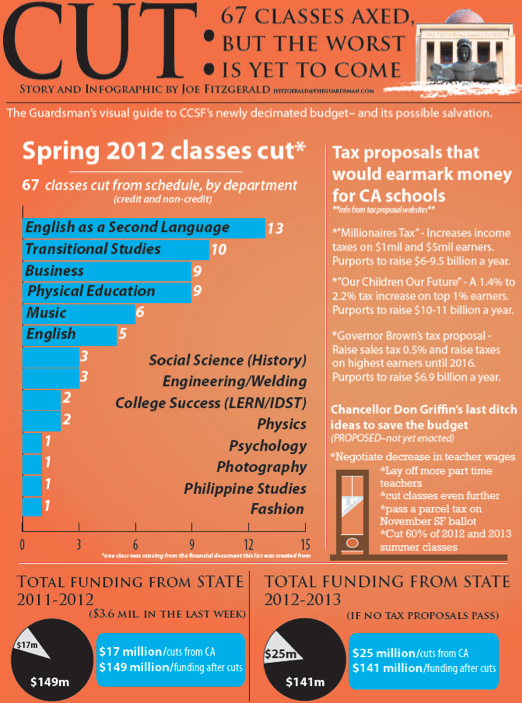 Correction: Last issue we incorrectly reported 78 classes were cut. This was due to misreading a sourcing error. The Guardsman regrets any confusion.